What is the key difference between PON, POL, GPON and OLAN? So, what is the difference between PON, POL, G-PON and OLAN? Do these alphabet soup acronyms all relate to the same thing and can they be used interchangeably? The answer is no - they are not exactly the same and they do have important differences. Passive Optical Network (PON) is an umbrella industry term for fiber-based access networking architecture that is used in both 1) enterprise passive optical local area network inside buildings and across campus and 2) residential fiber-to-the-premises network that can connect a home, apartment and a business across a city. Used inside local area networks (LAN) of buildings and across campus. Deployed by government, business enterprise, hospitality, education, retail, public venue and healthcare type network owners, operators and developers. Connects computers, phones, servers, Wi-Fi, building automation, building monitoring, building intelligence, security surveillance, all forms of enterprise video and all IP/Ethernet devices within the digital ceiling and Internet of Things realm. Today, it uses Gigabit Passive Optical Network (G-PON) technology standard ITU-T 984 that provides asymmetrical 2.4Gbps downstream and 1.2Gbps upstream capacity. POL is evolving to the next generation standard called XGS-PON which is based on ITU-T 989 and will provide cost-effective symmetrical 10Gbps downstream and 10Gbps upstream capacity. Now, this next detail is very important because it represents the key unique difference! POL electronics manufactures make tremendous investments in additional R&D to support advance Ethernet IEEE features to satisfy true enterprise requirements (e.g. bridging, LAG, VLAN, ACL, PoE, LLDP, NAC, 802.1x, AS-SIP, PON protection, Change of Authorization, DAI, MAB, etc…). A true Passive Optical LAN will have these features. The Association for Passive Optical LAN (APOLAN) is the trade organization representing this segment. There are different branded solutions of POL by the electronics manufacturers. 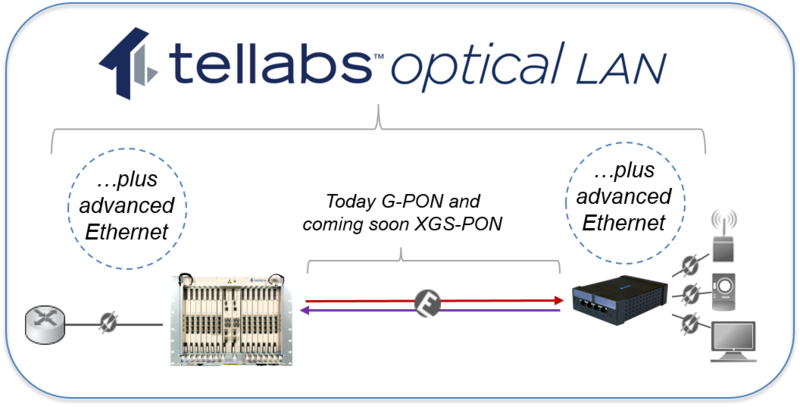 For example, Tellabs™ Optical LAN (OLAN) is the Tellabs’ branded solution. Used for last-mile access network to homes, apartments and businesses across a city. Deployed by telecommunications service provider network operators (e.g. Verizon FiOS). Connects services such as high-speed internet, phones, TV and residential Wi-Fi. It too currently uses Gigabit Passive Optical Network (G-PON) technology standard ITU-T 984. However, FTTP is evolving to the next generation standard called NG-PON2 which is based on ITU-T 989 and is a more costly and complex 40Gbps solution. Fiber Broadband (formerly FTTH Council) is the industry organization representing this segment. If you would like to learn more about Passive Optical LAN, you can follow us on our social media channels: LinkedIn Company, LinkedIn Group, Twitter, Facebook and Instagram.